The Governor of Ogun State , Senator Ibikunle Amosun , has attacked the National Leader of the All Progressives Congress , Asiwaju Ahmed Tinubu, and a former governor of the state, Aremo Segun Oshoba , over alleged complicity in electoral fraud in the state . 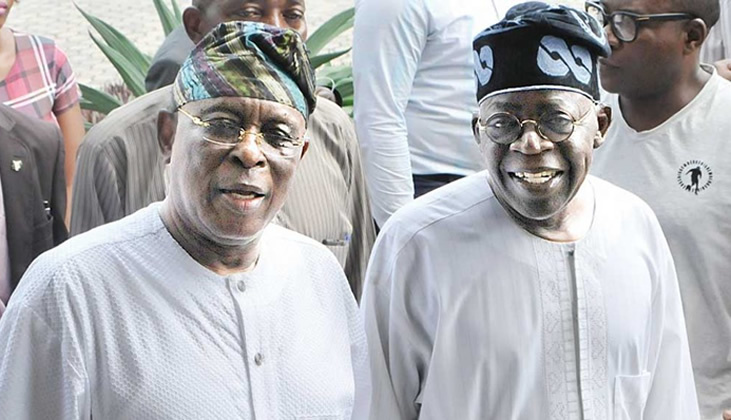 Amosun accused the two party leaders of “conniving with a cabal in Lagos” to write a fake result which produced Dapo Abiodun as the party’s candidate for the 2019 governorship election . Amosun said this in an interview shortly after swearing - in the new Chief Judge of the state , Mosunmola Dipeolu, in the Governor ’ s Office chamber in Oke - Mosan , Abeokuta on Monday . He alleged that the silence of the two party leaders , who were aware of what transpired in the state with respect to the primary, smacked of complicity. Amosun said, “ The President already knows there was no election in Ogun State . He knows that they just went to Lagos; wrote all results , and that what they did was fraud. He insisted that the only primary which held in the state was the one which Adekunle Akinlade won to become the party ’s governorship candidate . The governor said, “Mr President already knows there was no election in Ogun State other than the one we held . “The issue of Chief Osoba and Asiwaju and co , what we said was that there was a definite silence from their end, and silence means consent. You can record me and publish it in your newspapers. He added, “People at this level should be courageous enough to take position , to come out , to come and tell us whether there was election . “On governorship , the day they said they did it or not , the one that we had, there was live telecast, people even witnessed it. They all came that they are changing again. Not long after the swearing - in , about 200 APC councillors in the state staged a protest demanding that the party ’s NWC should recognise Adekunle Akinlade as the party’s governorship candidate . The councillors, who were armed with placards with various inscriptions, stormed the Arcade Ground within the state secretariat at Oke Mosan , Abeokuta, around 10 am . Some of the inscriptions on the placards read , ‘We want justice in Ogun APC’ , ‘ Give us Triple A ’, ‘Oshiomhole , Osinbajo , we want justice in Ogun State ’ and a ‘Minority cannot take charge over majority’, among others. They were said to be on solidarity visit to the seat of government to register their demand with Amosun . .
Ogun APC chairman, Chief Derin Adebiyi , later addressed the protesters. He said, “We have seen all the messages on the placards. I want you to remain steadfast in your demand , nothing negative will happen to the mandate you have given to Akinlade . “The elders and party leaders are looking into the matter . I want to urge you to continue to be peaceful , don’ t fight anybody . Almost about the same time , some groups namely , Ogun Progressive Students, Ogun Youth Assembly , Coalition of Ogun Traders , among others, organised a counter- protest. The protesters who converged on the Nigeria Union of Journalists secretariat, Oke Ilewo, urged Amosun , to accept the party’s decision and support Dapo Abiodun as the party’ s the governorship candidate . The groups on their part condemned what they termed the “determined mission of Amosun ” to drag the hard - earned integrity of Ogun State through the mud . They were led by the convener of Ogun Progressive Youths and students, Adeyemi Azeez; convener of Movement for Secure Nigeria , Abdul - Kabiru Ayoola; and the Secretary, Ogun Arewa Council , Idris Muhammad.